A to Z PARTY RENTAL – Let’s Talk Tent! A to Z PARTY RENTAL | Tenting 101 | Let’s Talk Tent! Let’s be honest, we don’t ever want there to be rain or bad weather the day of your event. Ideally it would be mostly sunny and 75 degrees. Unfortunately that isn’t always the world we live in… especially here in Pennsylvania! Rain happens, hot rays of sun beat down, and cold winds roll in. So Let’s Talk Tent. Tenting is an often overlooked but important element that anyone planning on partying outside should think about, and sometimes it’s a subject that can seem very intimidating. So what are tents? Simply put, tents are temporary structures that provide an event space for you and your guests. Tents are not a permanent building, and they require a good bit of planning. Tents are not something that can be or should be put together last minute, but should be carefully planned for. It is also best to book them as far in advance of your event as possible—tent and rental companies frequently book up weeks to months in advance, especially in the peak season! Where is the tent going? Will it be on grass, blacktop, or an elevated surface? This information determines not only the size of your tent, but the style as well. Be sure to do a little research on the area first, like taking a walk-through of the event space if you have never seen it before. Some may think of tents as large structures covered in white fabric. This can be divided into two traditional tent styles, frame tents and pole tents. Each style has advantages and disadvantages depending on your needs and on where it will be going. Pole tents have become the most popular style for weddings and special social events. They have very tall center poles that support the center peak(s) of the tent, and then require tension lines around the perimeter to keep the tent taut, upright, and in place. These tension lines must be staked down to safely support the tent; steel tent stakes are driven deep into the ground. Their high peaked tops give pole tents an elegant shape, and this design also lends itself to beautiful fabric drapery or string light decor attaching under the center peak. Pole tents also allow you to hang side walls all around the tent to keep guests comfortable in hot or cold temperatures. Frame tents differ from pole tents in their construction. Installers build the framework of the tent, and then attach the vinyl tops. The absence of center poles allows for more flow to the event space, and gives a more open look to the floorplan. 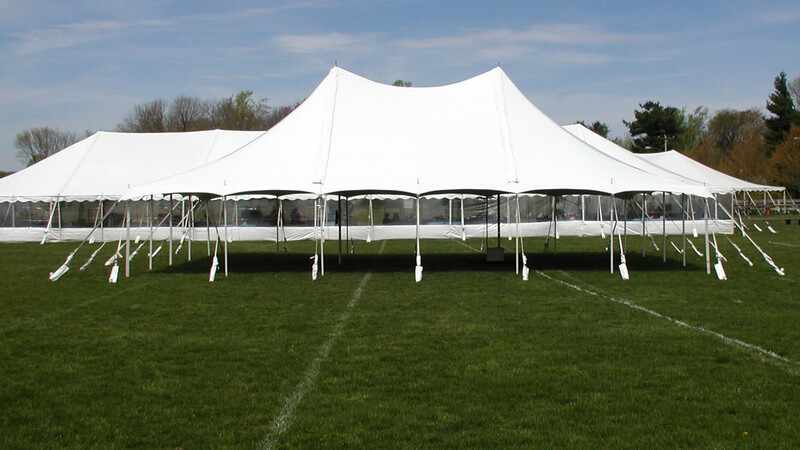 Frame tents are versatile as they can go on both grass and asphalt, being secured with either tent stakes or ballast. While frame tents are more “industrial” looking, they have their own advantages, such as customization of side walls, doors, and different types of tops. 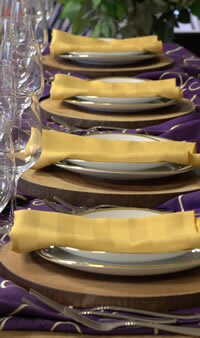 From an insider’s perspective, everyone should consider tenting for their special event. There is a massive amount of research that can be done online, not to mention some stunning inspiration images on Pinterest!